Lara Croft's next adventure will be her very, very first. It's no secret that Lara Croft - once the golden girl of gaming - has had less-than-stellar showings as of late. Her best recent title had nothing to do with the main Tomb Raider series, for one. Recognizing that the Tomb Raider name hasn't been holding up so well these days, developer Crystal Dynamics is hoping for a fresh start: Game Informer confirmedthe long-rumored series reboot this morning. This is Lara Croft younger and less seasoned than gamers have ever seen her. The new game - titled simply Tomb Raider - will tell the tale of her very first adventure, which is less a search for ancient treasure and more a fight for survival. Or, in other words, we could just quote the press release: "After a brutal storm destroys the boat she was travelling on, a frightened young woman is left washed ashore on an unknown beach. On her own but not alone she has only one goal, to survive." 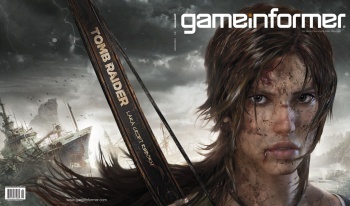 From the image we see here (Game Informer's January cover), Lara has certainly been in better shape. Consider us intrigued by the bow she's apparently wielding, though.